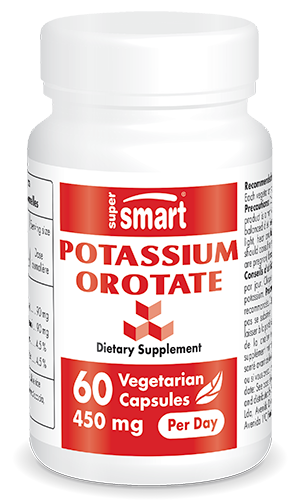 Potassium Orotate Supplement 150 mg | Multiple Benefits | Get Here! Benefits include helping to control the body’s acid-base balance. Essential for nerve transmission and good cardiovascular health. Potassium, one of the most abundant minerals in the human body, is concentrated in the intracellular fluid where it maintains osmotic pressure. Together with extracellular sodium, it also helps maintain the acid-base balance. Deficiency can show up as abnormalities in glucose tolerance tests, as well as in cases of adrenal fatigue. In chronic illness and alcoholism, potassium deficiency is often associated with magnesium deficiency. Each vegetarian capsule contains 150 mg potassium orotate. Take one to three vegetarian capsules a day or as advised by your therapist.